In 2-7 Triple Draw Lowball (sometimes known as Kansas City Lowball), the goal is to make the worst conventional poker hand. One of the most popular forms of draw poker — and now one of the go-to games for the highest stakes online — 2-7 Lowball can be found being played in mixed-rotation games across the world. In this game players have the opportunity to discard and draw to try and improve their hands – although the objective of 2-to-7 Triple Draw is to make the best low hand. In 2-to-7 Triple Draw, aces are always high and flushes, pairs and straights count against a player’s hand. Under these rules, 2-3-4-5-6 is not a winning hand (because it is a straight). Players must break up their pairs, straights and flushes and hope to draw low cards to improve their hands. It can be any combination of suits (without making a flush) and these are the lowest five cards that don’t contain a pair or make a straight or a flush. 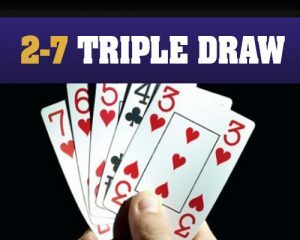 2-7 Triple Draw uses the same betting structure as hold’em. During the first two round of betting the limit is the small bet. So, if the game was a $10/$20 game during the first two round of betting a player could call or raise in $10 increments. The second two rounds of betting the limit is the big bet. In our example, a player can call or raise in $20 increments. 2-7 Lowball is a “blind game,” meaning the player to the left of the dealer puts in the small blind and the player to the left of the small blind puts in the big blind. Starting with the player on the left of the dealer and moving clockwise around the table, every player is dealt five cards facedown, one card at a time. Once all players have five cards, the first betting round starts with the player to the left of the big blind. Once the betting round has completed, the players enter the first drawing round. Starting with the player on the dealer’s left, the player announces how many cards he would like to throw away from his hand and receives new ones in return. The dealer deals all of the cards to that player at once before moving on to the next player. A player can choose to keep his hand intact and not throw away any cards at all. This is known as standing pat or rapping pat. If the player discarding all five cards is last to be dealt cards, the dealer will deal them four cards at once, then “burn” one card (discarding it face down on the table) before dealing hte player his fifth and final card. Once all players have received their new cards the second betting round begins, starting with the player to the left of the dealer. Only one player is left, the rest having folded. The players have completed the betting round after the third drawing round. 2-to-7 Triple Draw rules dictate that the player counts from the highest card in his hand down to the lowest. It’s also much easier to work out your hand is you count backwards from the highest card rather than up from the lowest. As with many lowball-type games, the drawing strategy may appear counterintuitive to players accustomed to games where high cards, straights and flushes are winning hands. Players accustomed to Texas Hold’em and other stud games often encounter obstacles when making the transition to draw poker, primarily due to a lack of information about their opponent’s cards. Players therefore need to rely on the betting patterns and drawing habits of their foes. When a hand reaches a showdown you will get to see the hands your opponent plays. This is critical information that will help shape your strategy – provided you have been observant and studied your opponent’s betting patterns, drawing habits and other subtle clues. With the widening popularity of poker games like Texas Hold’em and Omaha, players can easily forget about the other varieties of the game. For players looking for a break from their regular game, 2-to-7 Triple Draw can prove both an entertaining distraction and a fascinating challenge.